Avocado is one of nature's breath mints. 2 How Many Calories Are In a Chicken & Avocado Sandwich? Most people don't eat avocados for their breath-freshening powers, but that's just one of the benefits you'll get from snacking on this tasty fruit. Avocado's rich, creamy flesh cleanses your mouth when chewed, so it acts like a natural toothbrush. It even gets rid of bacteria and food debris caught in your throat and intestines -- that's something that even the best floss and mouthwash can't do. If you're ever without toothpaste, skip the trip to the drugstore and try chowing down on avocado instead. Set an avocado out at room temperature to allow it to ripen, if necessary. Depending on how hard the avocado is, this may take a day or two. To ripen faster, put the avocado in a paper bag with a banana or an apple. An avocado is ripe if it feels soft when you gently squeeze it. Slice the avocado in half lengthwise with a knife. Starting from the top, work the knife all the way around the avocado until you've separated it into two halves. Pull out and discard the brown pit. If the pit doesn't come out easily, use the tip of your knife to remove it. 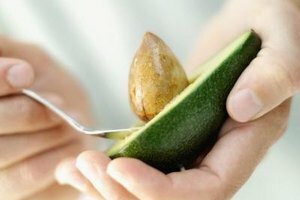 Scoop the avocado flesh out of the avocado half with a soup spoon. The entire half should come out intact without much effort. If it doesn't, simply scoop out the flesh in pieces. Cut the avocado into small, bite-sized chunks. Eat a chunk or two of avocado whenever you need to freshen up your breath. Alternatively, serve the avocado as an ingredient in salads, sandwiches, Mexican dishes and other meals. Place leftover avocado in a container with a lid. Store in the refrigerator. When you store a cut avocado, the green flesh will begin to turn brown after a few hours. This happens when the flesh comes into contact with air. The avocado is still edible; just slice off the brown part of the flesh. To slow down browning, sprinkle the avocado with a few drops of lime or lemon juice before storing. If you have a ripe avocado but you're not ready to cut and eat it, store it in the refrigerator. The cold will keep it from getting any softer. You can also store cut avocado in the freezer for up to five months.